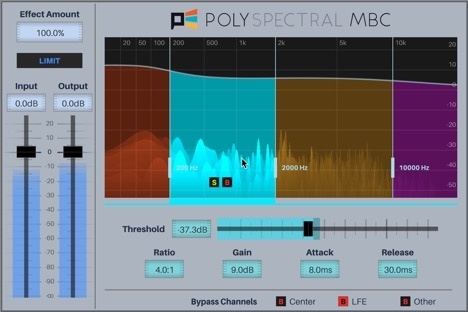 Polyspectral MBC is a new multi-band compressor plug-in for Wwise. I’m excited to be releasing it through the Audiokinetic Community Partner Program, which allows third-party developers to create plug-ins for Wwise and make them available on the Audiokinetic Store. Download Polyspectral MBC and try it out now! I first became interested in creating plug-ins for games in late 2016. I asked many game audio professionals what plug-ins would help them create great sound for games and got plenty of interesting ideas, many of them specific to certain types of games or gameplay scenarios. But one common thread which kept coming up and is relevant to almost any game, is that there is room for better mastering-focused plug-ins in game development. And why not? In almost any linear sound production -- music, movies, trailers, sound design -- plug-ins will be used on the mastering bus to achieve a greater level of cohesion and polish. They are also used simply to make life easier, by keeping powerful global controls all in one place. There’s no particular reason mastering plug-ins aren’t used as much in games, other than the additional technical challenges related to creating them. A multiband compressor seemed like a good first step towards filling this need. Games face unique challenges in managing dynamics. In linear media, a skilled mix engineer can ride faders to dial in the perfect mix, allowing the various layers -- music, ambience, sound effects, voice -- to fill the space around one another and make room for the most interesting or important elements and details. If only a skilled engineer could be included with every copy of your game, this approach would carry over perfectly! Alas, without knowing exactly what sounds will be played on top of other sounds, game audio creators sometimes have to make some conservative mix choices. Music and ambience are often very quiet to make room for sound effects and voiceover, and these in turn are heavily compressed, so that they don't get swallowed up in background layers. Sometimes the overall fullness, cohesion and detail of the mix suffers, especially when played back on mediocre speakers or in noisy environments. All too often this is the case! These are exactly the sorts of problems a good compressor can help solve. Background layers can still be mixed well out of the way of more prominent foreground elements, but can naturally rise in between to fill space and allow your carefully crafted depth of detail to shine through. Lower frequencies can be exaggerated at low volume levels to keep a more full, rounded sounded, yet kept under control during louder moments. Or, if your mix is already sounding exactly like you want, a multiband compressor can be used as a very natural sounding limiter, keeping the occasional peak under control. Unlike a single-band compression or limiting algorithm, it will kick in and control only the loudest frequency bands, so unrelated bands won’t be ducked unnaturally. With my goal of creating this plug-in set, I started designing it from the ground up with games in mind. First of all, this meant low CPU usage is a necessity. Even in games, for powerful consoles and PC’s, CPU cycles are often at a premium. I also wanted something fast enough to be practical on mobile devices! Another important requirement for games is low latency. Adding just a few milliseconds of latency into the audio processing chain is enough to make a game feel less responsive. So, I was careful to avoid design choices that would introduce any unnecessary latency. From the very beginning of the development process, I also wanted to build the kind of rich user interface that users would expect from their experience with traditional DAW plug-ins. This is especially important for multiband processing, where real-time graphical feedback can help the user understand their signal and what the plug-in is doing to it. Fortunately, Wwise is very flexible about this, and allows plug-in developers to develop as intricate a user interface as they would like. I believe Polyspectral MBC sets a new standard for user interfaces in game audio plug-ins. With my design goals set, I dove into development. Wwise makes it pretty easy to get a plug-in prototype up and running, so I was able to validate that I could get the kind of sound I wanted running live in Wwise with acceptable CPU usage. After that, I started the long journey of turning it into a finished product. Writing a good signal processing algorithm is the most important task when creating a good plug-in, but it’s only the tip of the iceberg . There’s also user interface development, testing, and refinement; optimization for different architectures; and setting up infrastructure to build, deploy, and test across the many different platforms that Wwise supports. In a way, it’s not so different from developing a cross-platform game! In the end I think I’ve succeeded in creating a high-quality product that lots of games can benefit from. Don’t take my word for it, try it out today! It is simple to download, install and use in the Wwise editor in your project, using the SoundCaster to see what your mix will sound like through the plug-in. I’m excited to hear it in action in games, and to hear what uses people come up with for it! I also look forward to seeing what other plug-ins are created through the Community Partner Program. The program makes it easy for plug-ins to be made available to the Wwise community, and also easy for game developers to try them out. It has the potential to bring a great deal of new possibilities to the already powerful Wwise platform. Interested in featuring your plug-in on the Audiokinetic Store? Ethan Fenn has been in games for a decade and a half, doing all things audio related. He worked on the original Guitar Hero and Rock Band games at Harmonix, and was on the founding team of Boston-area independent developer Fire Hose Games. He started Polyspectral in 2015, where he does audio programming consulting and builds plug-ins and other audio tech for games. Loudness Processing Best Practices, Chapter 2 : Loudness, dynamics and how to process them.